Woods are where you get the goods! The more often I ski, the more time I spend avoiding trails entirely. While I have some favorite trails that I will always hit at least once, the woods are my true home. 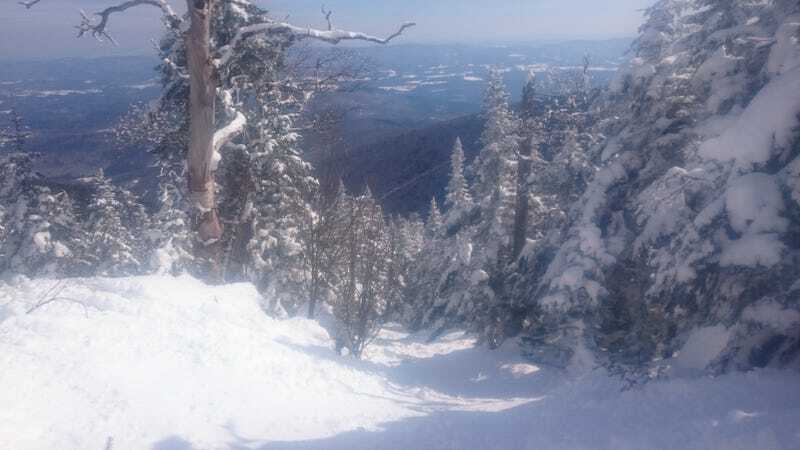 Here at Sugarbush, they have recently gotten about 2 feet of snow over the last week. So there are some really good powder stashes everywhere. Today I went on a back country adventure to explore an area I haven’t been before. The first time through was kind of crazy just because I had no idea where I was going and got separated from my friend. But that spirit of adventure is kind of the best part. I knew it led to a street eventually where a bus would take me back to civilization but getting there involved crossing rivers, trekking uphill in certain places, and flying through unknown trees. Thankfully the powder was DEEP and there were a few surprisingly open areas. Either way, this was an excellent way to spend a holiday weekend. There’s no crowds in the woods, even if the base area is a zoo! This is REALLY open for backcountry. But it had endless steep powder on it so I’m happy!